Purposeful Clouds: Doing more with less is simpler than you think, Really? Doing more with less is simpler than you think, Really? Accelerating return on your IT investments and reducing total cost of ownership is a lot simpler than you think. The recipe requires: i) leveraging the right Cloud model; ii) using intelligent workload management where workload is defined as an integrated stack of application, middle-ware and OS; and iii) a dash of discipline. Being able to accomplish a lot more with a lot less is one of the main reasons for the exponential growth in adoption of the Cloud computing paradigm. If you know your business requirements for your IT now, six months from now, 1-2 years from now, and long term, you are going to have a lot of fun identifying opportunities to reduce IT costs without compromising on your business requirements. Many concerns about risks with the Cloud are overblown by those who are either unaware, trying to catch up, or defending the old ways. Usage based Cloud pricing model can help convert traditional 5-10% capacity utilization or, should I say, 90-95% wasted capacity utilization priced model into delivering potentially 10 to 20 times cost improvements. Just working on a plan that defines the future IT state with the Cloud will enable you to see opportunities to do more with less. 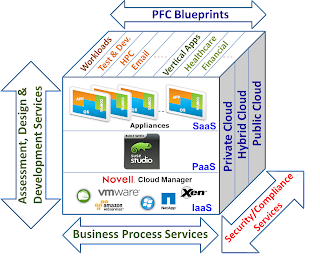 As you start assessing opportunities and creating plans, you get into a virtues cycle of interacting with the forward looking experts and a number of “best in class” Cloud Service Providers (CSPs) who will help you architect, plan, build, support and transition to the right set of possible future states for your IT infrastructure. You can mix and match various Cloud Models that best fit your business needs and leverage management software that supports orchestration, work-flow management or going from Cloud to Cloud and around. However, leveraging the Cloud for your infrastructure is only half the fun. 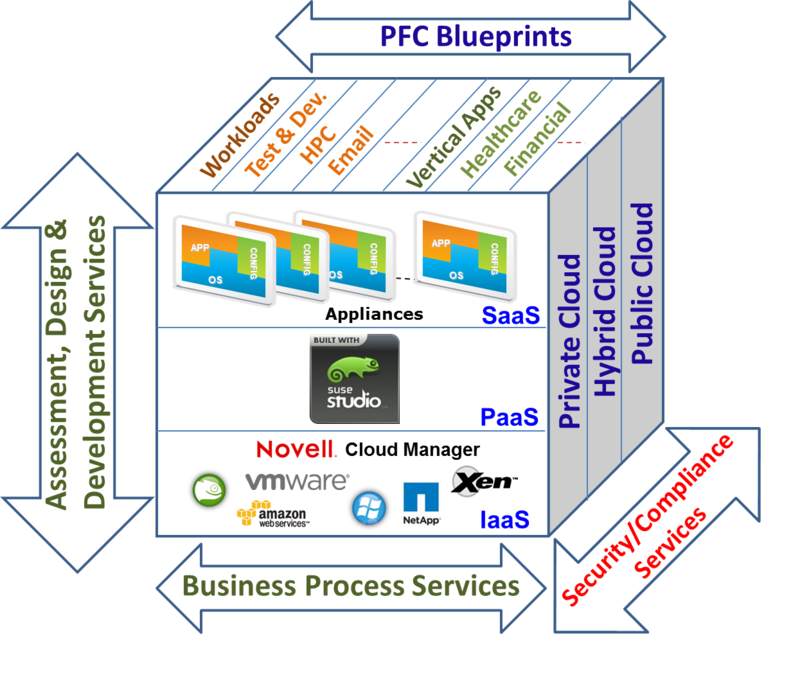 We know that applications (workloads) and associated processes (for a future blog) constitute business services. If some or all of your application needs can be met by SaaS offerings then Return on Investment (ROI) and Total Cost of Ownership (TCO) analysis is simpler. Similarly, if you use third party applications then you do need to shop around a bit to make sure that you are getting best value from the software licenses paid. On the other hand, if you are are an ISV or build and maintain in-house developed applications, taking advantage of PaaS (for a future blog), Application Appliances and associated tools will reduce costs and give you many competitive advantages. Software appliances that encapsulate “what you need for an application” to run on a standardized platform are revolutionizing the software industry and associated business models. Whether your application is designed and developed using 3-tier architecture, SOA, or SaaS, it needs to be configured and updated on regular basis. The right set of tools enable businesses create, configure, update and deploy appliances delivering services on Public, Virtual Private, Private or Hybrid Cloud models in a matter of seconds. By combining the best of the Cloud and appliances models you can get a lot more, a lot more faster and for a lot less cost. If you are thinking that it is easier said than done then you are right. To realize the above stated gains, we do need to learn and develop a minimal set of new processes and disciplines. I call them “a dash of discipline”. For example, benefits from usage based pricing will disappear fast if uncontrolled or wasteful use of workloads consume resources, or if applications are architected or coded without any regards to their hardware or software resource utilization. Is this a wake up call for developers (for a future blog). Although there is a lot to learn during our journey into the Clouds, it promises to be rewarding at every step of the way. In an attempt to put our arms around the above ideas and opportunities, following PFC Cube is an attempt to present it all together. Let us know want are your views on this and participate by either posting your comments to this blog or attending our upcoming Webinar on October 13th. Acetech is a leading India. Acetech give Software Development in delhi Solutions according to Client’s Requirements.